Après prêt de 3 mois de procédure et de contacts avec des acteurs de l’industrie, de joies mais également des déceptions, c’est avec tristesse que je vous annonce que le Tribunal du Commerce a déclaré ce jour la mise en liquidation judiciaire de Spidinvest (Spidart.com). Spidinvest SARL (Spidart) was founded by CEO Nicolas Claramond in October 2007. It was a fan-funding website much like the original SellaBand and AKA music. “Fan-producers” could “invest” in an artist with €10 or more. When €50,000 was reached the artist was able to record an album, of which the fan-producer would recieve a copy. The profits of the album during two years were to be divided: 35% for the artist, 35% for the fan-producers and 30% for Spidart. Only 11 artists got funded on Spidart. If you compare that to SellaBand’s current 42 funded artists you can see part of the reason why Spidart failed: too little financed projects. Was there too much competition? Besides the international fan-funding sites like SellaBand there are also four French fan-funding websites that I know of: AKA music, My Major Company, BuzzMyBand and (Re)venons à la musique. La société Spidinvest, éditrice du service Spidart, fonctionne en fonds propres et, en aucun cas, via les investissements de production des fan- producteurs. Les comptes bancaires sont, depuis le premier jour, totalement séparés. 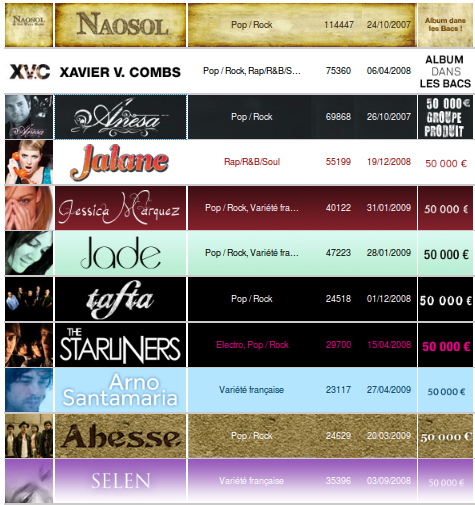 Les investissements des fan-producteurs servent exclusivement à financer la production des albums (studios, musiciens, productions artistiques, clips, supports promos, promos médias, marketing, showcases…). C’est le cas pour les 10 albums déjà réalisés ou en phase de production actuellement. Le fonctionnement du site Spidart (développement, partenariats, promo…) est financé exclusivement en fonds propres grâce à des business angels (investisseurs privés) à ce jour et très prochainement avec le soutien et l’entrée au capital de fonds d’investissement. C’est également sur ces mêmes fonds propres que Spidart finance la promotion et le marketing des artistes. MattRach decided to leave Spidart and on 16-05-2009 the money was refunded to the fan-producers. Selen is now raising money to record her album at My Major Company. So What is a band from The Hague, Netherlands. Passe Partout is the second music video from their debut album Tiptoes. More So What at Long Way To Rock. Yesterday I adopted Joep. Joep was the car from Rally Team Discovery at the Amsterdam Dakar Challenge 2009. His life will not be as adventurous from now on, but I hope he will still enjoy his time with me. See 23 Brilliant Logos With Hidden Messages at TheRoxor Design Blog. The contents of any one panel are dependent on the contents of every panel including itself. The graph of panel dependencies is complete and bidirectional, and each node has a loop. Alex Lundry, VP and Director of Research of TargetPoint, talks about the political power of data visualization. I used to keep track of my book collection in an exercise book. In the early nineties I made a Filemaker template to keep track of my personal library. (I made it available as shareware and called it “Book Catalogue”.) A few years ago I lost my catalog due to a computer crash. Now I am looking into an online solution to catalog my book collection. I really like that on some sites you are also able to connect with other book lovers besides cataloging your library. Of those LibraryThing and Goodreads seem to work best for international books. I will give them both a longer test drive before I make my decision. BookCrossing also looks very interesting. Earlier today at about 11:00 I saw a great (white) egret (Dutch: grote zilverreiger) walking on a frozen ditch beside our house. Unfortunately it flew away before I could get my camera and take a picture. It would have made a great picture of the white bird with all the snow. I don’t remember having seen a white egret before. Adam Savage, co-host of the Discovery Channel television series MythBusters, gives a captivating talk on the nature of his particular obsessions at The last HOPE conference. You are currently browsing the Onno Hoogendoorn blog archives for January, 2010.